This topic provides an overview of how to create and edit custom ingest profiles. To access the Ingest Profiles administration page, click the ADMIN link and then Ingest Profiles. Note that to access the Ingest Profiles administration page, you must be a Video Cloud Studio user with the Administrator role. A list of ingest profiles will appear. Note: Clicking the Show API name link in the header will display the internal name of the ingest profile. The internal name is used when using the ingest profile name in an API call. Dynamic Delivery - Dynamic Delivery transcoding is used. 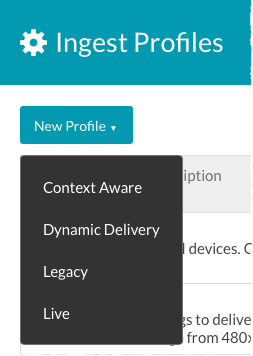 For information on Dynamic Delivery, see Overview of Dynamic Delivery. 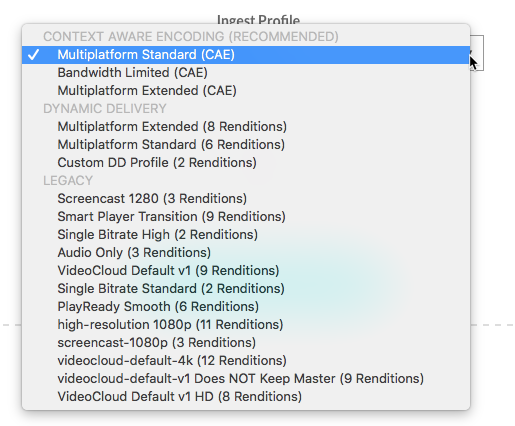 Context-Aware - Context-Aware transcoding is used. For information on Context Aware Encoding, see Overview of Context Aware Encoding. Standard VOD - Indicates that this is a default profile provided by Video Cloud. This type of profile can't be edited or deleted. Custom VOD - Indicates that this is a custom ingest profile. Standard Live - Indicates that this is a default Live profile provided by Video Cloud. This type of profile can't be edited or deleted. Custom Live - Indicates that this is a custom Live ingest profile. Renditions - The number of video renditions that may be created. Display - Determines whether the profile is displayed and can be selected in the Upload module. Note: When lower quality source content is uploaded and one of the standard profiles is selected, Video Cloud will only produce renditions that are equal to or lower in quality than the source. When creating your own custom profiles, you may want to use conditional output parameters to prevent renditions from being generated if the source doesn't match the quality criteria you specify. This will prevent the dynamic ingest system from creating higher quality renditions when lower quality source files are uploaded. Ingest profiles can be configured to archive and distribute master (source) files. Archiving the master keeps a copy of the master file and provides the ability for the video to be re-transcoded in the future without the need to upload it again. Distributing the master enables the master to be pushed to the CDN and used as a playable rendition. 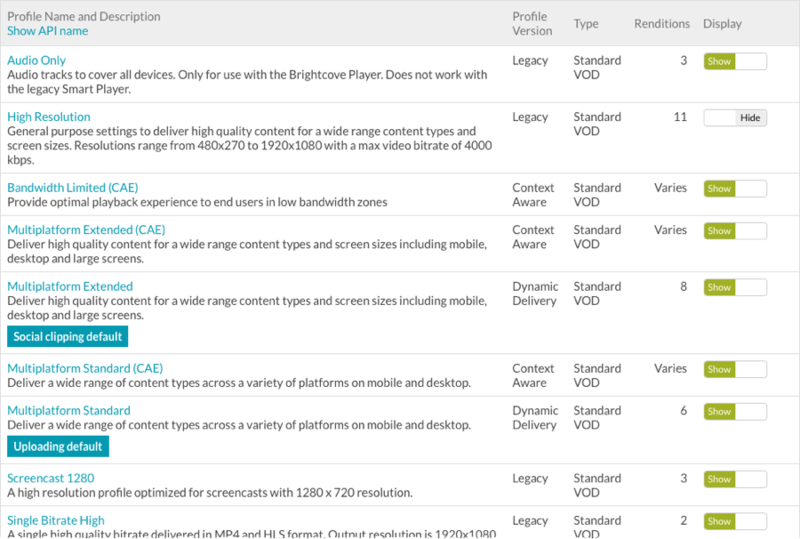 The Standard VOD ingest profiles are configured to archive and not distribute the master. You may wish to change this behavior when creating a custom ingest profile. For additional information on archiving and distributing masters, see the Archiving Masters document. For a list of all the fields that can be configured when creating ingest profiles, see the Ingest Profiles API Fields Reference developer document. To create a new ingest profile, click New Profile. Click the delete icon ( ) next to the ingest profile or click the profile name and then click Delete Profile. A default ingest profile can be configured for when videos are uploaded and when clipping using the Social module. The upload default profile is indicated with next to the profile name. The social clipping default profile is indicated with next to the profile name. Note: When selecting a default ingest profile you should ensure that the profile is visible and not hidden. Ingest profiles that are hidden will not appear in the Ingest Profile list in the Upload module. Note in this example that the high-resolution profile is not displayed.